currently includes more than 1600 typical business letter templates. With this software, you can write impressive and effective letters yourself with strengthened skills, less time and no extra money cost. The embedded text editor in this software download allows you to edit, copy, paste, search, preview and save your letters. It also enables you to set an external e-mail program to send your finished letters directly. 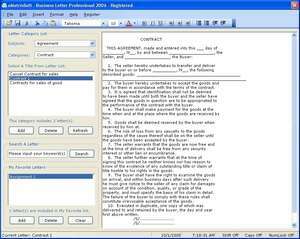 Business Letter Professional 7.30 is a shareware program and can be used as a demo to try the software until the free trial period has ended. A full version of the program is available after the trial period ends. For security reasons, you should also check out the Business Letter Professional download at LO4D.com which includes virus and malware tests. Additional screenshots of this application download may be available, too. 2.41 out of 5 based on 15 ratings.